My kids go to school in Montgomery County, Maryland, one of the best districts in the U.S. and yet my 10 year old is struggling to put words onto paper. Here I am, a writer, an editor… a person who loves words. And I have really struggled with helping my son, because the way he is taught makes no sense to me. He brings home the most inane worksheets, character maps… busy work! I don’t write like that and I don’t even like thinking about them. The result of such clerical work is usually unreadable. Few people who learn to write this way ever make it their life’s work. The professional writers I know got excited not in class but while compiling personal journals, or composing poems and songs, or sending long letters or e-mails to friends, or working for the school newspaper. A friend of mine who teaches said she uses the “hamburger model” — layering sentences in each paragraph — for teaching writing to little kids. No offense, Debbie, or if any of my kids’ teachers read this, but… I can’t imagine getting excited about writing that way. It is clerical. It’s boring! No, it’s mind-numbing. And it has very little to do with translating thoughts onto paper. I have a vague and excruciating memory of being forced to write a paper on Huckleberry Finn in high school using outlines and this kind of structured paragraph. Eeek! I essentially studied reading and writing in college (English lit, history and Spanish) and wrote a whole lot of papers. I skipped Freshman English, but had a writing seminar first quarter Freshman year where I learned a lasting lesson. My professor, Michael Squires, covered my papers with T’s for “Tighten”! Say what you mean in as few words as possible. Cut to the chase. I’ve been writing professionally for decades — research reports, proposals, articles, books. I have never once thought about structuring my paragraphs like hamburgers. I think about what I’m trying to say… and then I make sure I say it clearly. And I Tighten (thank you, Dr. Squires!). And I edit, edit, and re-edit my own work. So, I struggled with helping my son, and then a light went off and I thought… no, I cannot help him with any of the busy work, but I can help him learn to write, because I love to write and I am good at it. Reading and writing and learning about words and loving them… that I get. I know that teachers have a tough job, but using structured methods is not the way to teach a creative skill. Jay Mathews is apparently getting quite a lot of feedback. The latest column asked people to share their anecdotes: What made you a better writer? I’m looking forward to the follow-up columns. 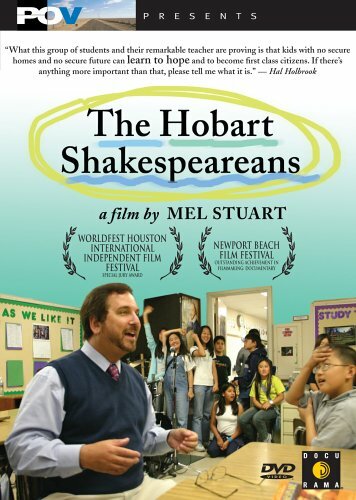 So, with this all recently on my mind, it was with great interest that I watched The Hobart Shakespeareans (made by Mel Stuart for the PBS series POV). 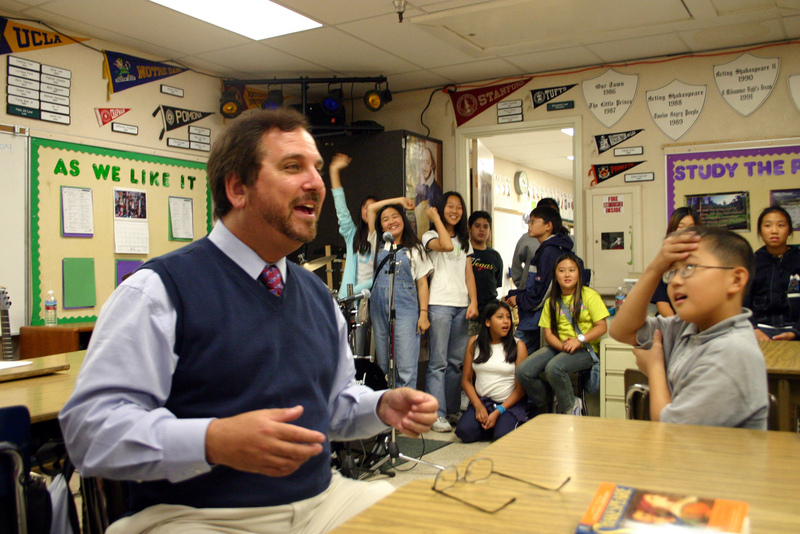 In the mode of Jaime Escalante, made famous 25 years ago in Stand and Deliver for hooking inner city kids on calculus, this documentary follows Rafe Esquith, who uses Shakespeare and great literature to hook his 5th graders. A veteran elementary school teacher who has respect and high expectations for his students, Esquith loves what he does and he sees huge rewards for his efforts. In contrast to the suburban school my kids attend, Esquith teaches in a huge inner city Los Angeles school surrounded by inner city crime. In one scene, there is a murder a block away and they lock down the school rather than letting the kids walk home with a killer loose. The kids take it in stride — this is the reality where they live. Yet Esquith has created an oasis for these kids with two rules: Be Nice. Work Hard. And they do. They learn to play music, they read great literature they can relate to like Of Mice and Men, The Lord of the Flies, and Huck Finn (hopefully without writing outlines and hamburger paragraphs!). And they read and play Shakespeare. 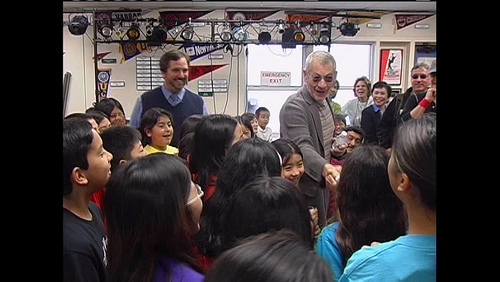 In the film, Shakespearean actors Michael York and Ian McKellen (who the students treat like a rock star) visit the class to share their love of the Bard. The children put on a performance of Hamlet. A teary McKellen notes that what always impresses him in Esquith’s class is that the children understand Hamlet… they really understand the words. He notes that this cannot be said for all actors who play Shakespeare. Esquith is realistic. He is shown speaking to a shocked audience at a teachers conference about the fact that some kids will get left behind… that he knows that’s the truth and that some kids fail. His point is that if everyone is given a fair chance, it is then up to the kids to decide to do the work. He has a big poster in his classroom that reads, “There Are No Shortcuts,” and in one scene he is shown talking to some kids he caught cheating… he talks to them quietly and says afterward that he knows it won’t happen again. The students are from immigrant families — the year this was filmed, all the students spoke English as their second language and spoke their native language with their families at home. Most are Latino or Korean. The neighborhood is rough. Esquith wants them to get out. He wants them to get a taste of the world they can strive for, so he takes them on trips to Washington DC and Mount Rushmore and they stay in nice hotels and eat at good restaurants (a nonprofit organization started by a former student funds their activities). He takes them to colleges so they can see what it is like in a place of learning and respect where everyone is working hard and no one will bother them. He tells them he believes in them and he knows they can do it. I wish my kids could have an experience like this instead of the busy work “great curriculum” that results in high standardized test scores (I guess) at their school. I’m reminded of a quote my friend uses: “In theory there is no difference between theory and practice. In practice there is.” (Not sure if this originally comes from Yogi Berra or Einstein or computer scientist Jan L. A. van de Snepscheut!) I think it describes the situation at my kids’ school. There is a disconnect when they teach mean, median, and mode to second graders who haven’t yet mastered division. There is a disconnect focusing on the mechanics of writing and leaving out the art and creativity and meaning. I think teachers like Escalante and Esquith make the connection between theory and practice. They create a passion in the kids and help them find meaning. It’s a rare gift.